The heart of this Ministry is the focus on service to the community through the maintenance of the Worship space. This Ministry offers the members the opportunity to spend quiet time in prayer while they serve in this ministry. Not only does this Ministry assist in reducing the maintenance cost, it provides the opportunity to be part of the community. 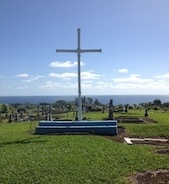 In providing general cleaning, the cleaning teams maintain the Altar, Tabernacle Area/Back Chapel, Sacristies, bathrooms and the front and back lanais. Special liturgical celebrations may require additional duties. Cleaning is usually scheduled for Saturday mornings but can be done at times that are most convenient for the respective teams. Volunteer are always welcome because, as is known, any workload is made lighter when more people participate and work together. With more volunteers available, there will be fewer assignments for the various crews. When visitors come to our Church, they frequently comment on how well maintained the Church is. They never see ignored restrooms, chairs with old bulletins on them or dust and dirt. The cleanliness and general appearance of our Church shows to our community as well as to visitors how much we care for the space where we come together to praise and worship. This is due to the generous work of the cleaning teams.